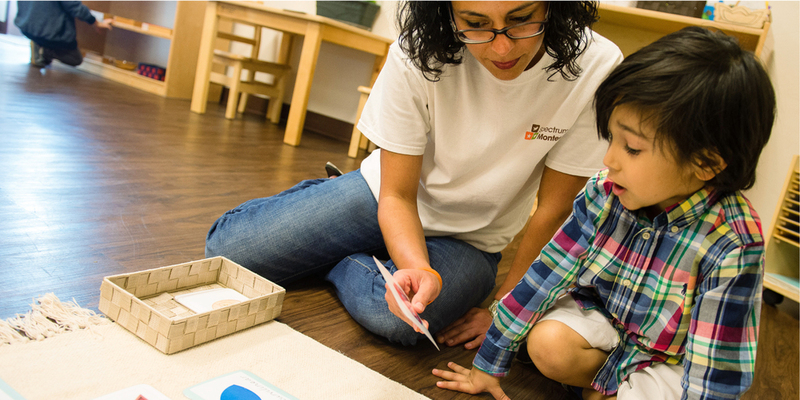 Spectrum Montessori is a year-round school that is committed to providing high quality education in an enriched environment where each child’s individual development is recognized and celebrated. We center our education philosophy on Dr. Maria Montessori’s love and lifetime study of young children. The ultimate goal of our Montessori program is to engage young learners and provide a foundation for a life of joyful and successful learning. We are a Christian based Montessori school. To meet the needs of working parents, we offer half-day and full-day academic programs with extended childcare services. Our hours of operation are Monday to Friday from 7 am to 6 pm. Our school offers programs for children from 3 months to 6 years. We invite you to visit our school to learn more about our Montessori curriculum. To schedule a private tour, please contact us by phone or email. When the decision to apply is made, please complete the registration form and email to the location of your choice. We look forward to seeing you soon!